Starring a young George Clooney and Quentin Tarantino, From Dusk Till Dawn blasted onto movie screens in 1996. 22 years later and the cult classic has been given the video slots treatment from Novomatic. It’s a 5 reel, 50 payline game that comes with base game extras that award added wilds, transforming symbols and multipliers of up to 25x. There are also 2 free spins features on offer. Join the outlaw Gecko brothers from between 50p and £10 per spin. On The Run Bonus feature – an animated getaway car burns its way across the screen. It leaves behind a trail of wilds. A payout is then made with the extra wilds in position. Everybody Be Cool Bonus feature – the Keitel, Lewis and Tarantino symbols randomly morph into the top paying Seth Gecko (Clooney) symbol and a new payout consideration is made. Cash Explosion feature – land a winning combination that pays more than your total stake and you could benefit from the cash explosion. This is a multiplier that can boost your payout by between 5 and 25x. The main features come by landing 3 scatters on the same spin. You’ll then spin the Bonus Twister Wheel. Land a cash amount and that’s what you’ll win. If the pointer falls on a bonus, you’ll win 1 of the following feature rounds. Dancing Bonus feature – on offer here are 10 free spins complete with a dancing wild (Santanico Pandemonium aka Salma Hayek) that moves around the reels on each free spin, changing size as it does so. This wild can cover anything between 2 and 12 symbol positions. This round is played on a new set of reels and features a different paytable from the base game. Look out too for reels 1 and 5 which can catch fire in the Xtra Stacks feature. When they do, the whole of that reel will show the same matching symbol. Mugshot Bonus feature – the second feature is played on a new set of reels that features 15 individually spinning symbols. The only symbols on show are Seth, Richie, Change and Level Up. To start you’ll receive 3 free spins. Whenever a Seth or Richie symbol stops, a prize is awarded. The number of free spins reset to 3. When a Change appears, all the Richie symbols turn into Seths. A Level Up moves takes you to the next payout level. There are 5 levels in all with prizes on offer rising as you go. The feature carries on until you’ve used up all your free spins or the whole screen is filled. Fill the screen and a bonus of 5,000 times your total bet is on offer. 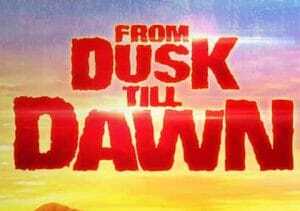 From Dusk Till Dawn seems an unlikely choice for a video slot adaptation. It’s proved to be a good one though as this is an entertaining game that offers plenty of variety. Even the visuals are good which we don’t always say about games from the Novomatic stable. It’s not as volatile as some others but the range of extras delivers enough action to keep thing interest. The variance is in the medium range. It’s an entertaining play and certainly worth investigating further. If you like movie video slots, there are lots to choose from like Microgaming’s Jurassic World or NextGen Gaming’s The Mask.